“A Washington State University research team has developed a new way to separate carbon dioxide out of industrial processes — an important key in reducing industrial carbon emissions that contribute to global warming. Led by Min‑Kyu Song, assistant professor in the School of Mechanical and Materials Engineering, and Ph.D. student Xiahui Zhang, the researchers developed a way to create hollow, nanorod‑shaped porous materials made of cobalt metal ions and organic molecules to separate the carbon dioxide in a way that works under real‑life conditions. They recently published their work in the journal, ACS Applied Materials and Interfaces. The work also includes researchers from Nanyang Technological University in Singapore. 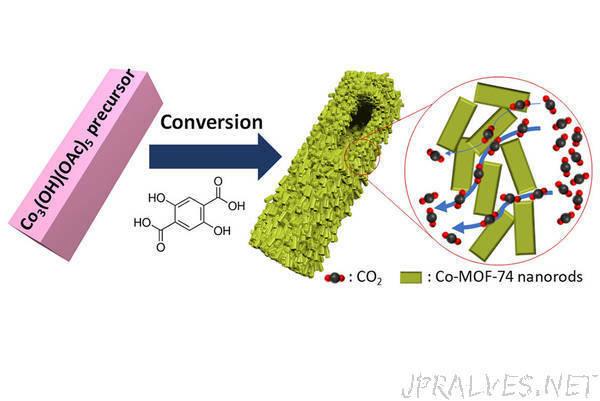 Microporous materials, known as metal‑organic frameworks, hold great promise for carbon capture because the large surface area of the tiny particles offer a large number of accessible sites to interact with carbon dioxide. The nanomaterials do a good job of taking up carbon dioxide under carefully controlled, equilibrium conditions, but fail in realistic operating conditions. In their work, the WSU research team improved the performance under a dynamic flow condition by designing a novel structure of materials. They developed a new architecture for the crystals, shortening the distance that gas molecules have to travel and creating a hollow nano‑sized rod that allows carbon dioxide to enter and get to a reaction site more easily. The synthesized materials with the unique architecture continued working successfully through 10 cycles, which is a “pretty good lab‑scale demonstration,” said Song. The next step in their research is to demonstrate the scalability of the process. They are also continuing to study other types of metal‑organic crystals. While their research is an important first step in realizing practical gas separation technologies, “there are still significant research challenges in efficiently collecting and storing carbon dioxide at a low cost,” said Song.